I bought the Tele version from Saga. The G- and B-string tuner holes in the headstock were drilled too close together, making it impossible to fit the G tuner to the headstock and making it impossible to tune the G string accurately. Also, one wire was too short, so I had to supply my own. The distributor wouldn’t correct the problem, told me to contact Saga. Saga never responded. The guitar is useless (wasting not only the money for the purchase but the cost of the paint, hours invested, etc). You don’t want this product! I purchased one of these kits from an on-line seller several months ago and put it together. My review will strike a middle ground between the others that have already been written on Amazon.com. Compared with the Saga Telecaster copy kit (which I’ve also reviewed), this one actually is a bit easier to assemble. Most notably, feeding the wires through the pre-cut holes is considerably easier. The kit I received was wired correctly; however, I’ve read more than one review on the Internet from purchasers who have received badly wired kits, so maybe I was lucky. The body on my guitar was pretty nice looking, so I went with no paint, no stain, just lacquer clear coat. Clearly, the body consists of several pieces of wood put together, but it finished very nicely. Given my previous experience trying to stain a Saga P-bass kit and painting a Saga Tele kit, the natural look is the way to go. OK, so it might look a little like a cutting board — just keep it out of the kitchen… The strings I received were far worse than those with the other two Saga kits (Tele copy and P-bass) I’ve built. The problem was that two of them were terribly kinked. Because I’ve assembled the kit as a gift and will be replacing the strings with some nice GHS Boomers before Christmas 2009 anyway, it’s not a problem that the G and D strings don’t fret properly at about the 9th and 10th frets: the new strings will fix it. The fingerboard is fine (actually looks quite nice after a little fretboard oil treatment), the frets are fine, and the electronic are fine. The “whammy bar” works OK, but I’m not a big fan of them. My suggestion to the recipient of the Christmas present will probably be to avoid it and practice on the fundamentals. Truthfully, I like the Tele kit better, despite the overly small pre-cut wiring holes. Perhaps more importantly than anything else, the “T” kit sounds more like its Fender inspiration than the “S” kit sounds like its Fender inspiration. Still, it was a fairly easy, fun project and looks very cool. I decided after reading about these guitars on the net, to try and build my own. 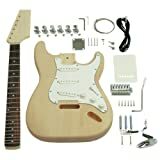 (go to guitarattack for examples) Not the highest quality guitar but more than suitable as a starter build. The neck is in great shape, the frets are smooth and well seated. The body does have the worlds strongest sanding sealer on it. I sanded the sealer down so that it wasn’t that thick. There were a few bubbles under the sealer that I had to fill after sanding it down. The body itself was three pieces of basswood glued together. I’ve read others claim 5 or 6 pieces on theirs but mine had 3. by the way don’t be afraid of basswood, alot of $500 and $600 guitars use this wood. At the time of writing this I haven’t fully built the guitar so I can’t comment of sound and the electronics. I did a dry fit and all the holes lined up and the neck fit the pocket fine. You can find these cheaper elsewhere but I trust amazon and their partners more than ebay anyday. It did ship in a flimsy box but didn’t have any damage. I have built two of the Saga ST10 kits and they are extemely simple to build. The only materials not furnished in the kit are paint, sandpaper, sanding blocks and a scroll saw. The guitars have nice balance and are very similar to my Fender strats in weight. The neck pocket is very tight and it helps to sand the sides of the the neck base to get a good fit. I would prefer solder connections to the push pin socket type, but there has been no problem with the connections so far. I painted mine with 1969 Corvette touchup paint and it looks like a strat from that era. The neck is actually nicer than some of my factory guitars. My son purchased this kit for a school project. Ultimately we found out that it was wired incorrectly- verified by both his industrial systems teacher and myself, an engineer. Emails to the parent company, Saga Music, went COMPLETELY unanswered. Since my son had already painted/finished part of the body before getting to the wiring stage, the instrument was deemed unreturnable. If you want to flush $160 down the drain, go for it. I wouldn’t recommend this product to anyone. I give it the lowest possible rating and I fervently hope the people who produce it go out of business.